Converted from Great Lakes passenger steamer "Seeandbee"
Propulsion: (6) single-ended and (3) double-ended coal-fired Scotch boilers, 165 psi. Inclined 3-cylinder compound steam engine, 66", 96", 96" dia. pistons with 108" stroke. 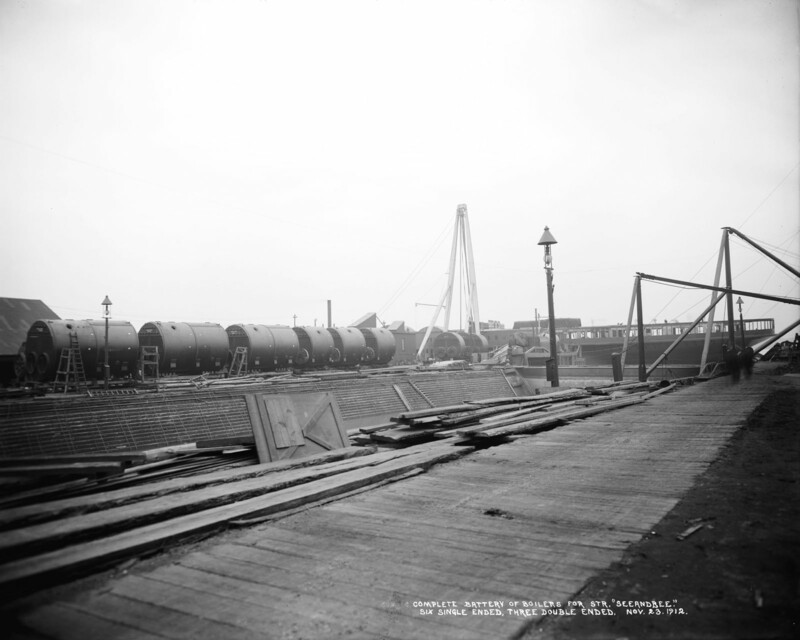 (2) side paddlewheels, 32-ft dia. w/ 11 blades, abt. 100-tons each. The USS Wolverine (IX-64) was converted from an old side paddlewheel excursion steamer "Seeandbee" by the US Navy. The inland passenger steamer was originally launched in 1912 and served the Cleveland and Buffalo Transit Co. on the Great Lakes for nearly 30 years. 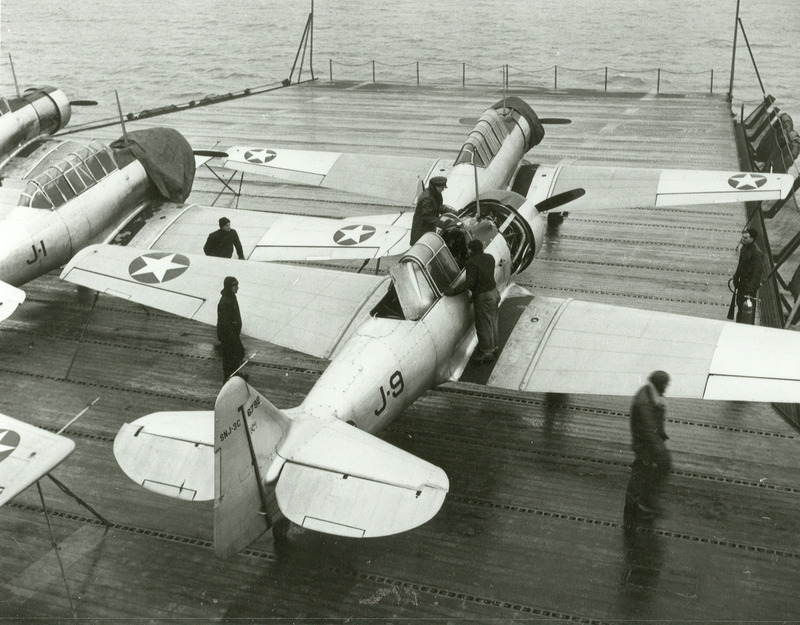 At the outbreak of WWII, the US Navy acquired the Seeandbee, and it was converted and repurposed as a training aircraft carrier in 1942, to qualify young naval aviators for carrier landings and take-offs. 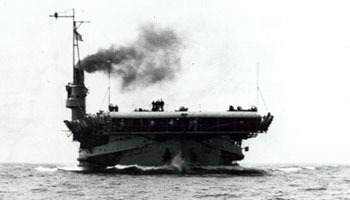 Due to the war's initial shortage of aircraft carriers and the off-shore threat of German U-boats, the US Navy created two makeshift carriers for training new pilots in the submarine-free waters of Lake Michigan. 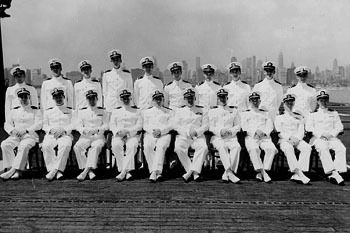 The 9th Naval District spearheaded the plan and operation, which resulted in the commissioning of the USS Wolverine (IX-64) and USS Sable (IX-81) in 1942 and 1943 respectively. Both flattops maintained their original propulsion systems as coal-fired steamers driven by twin side-paddlewheels. 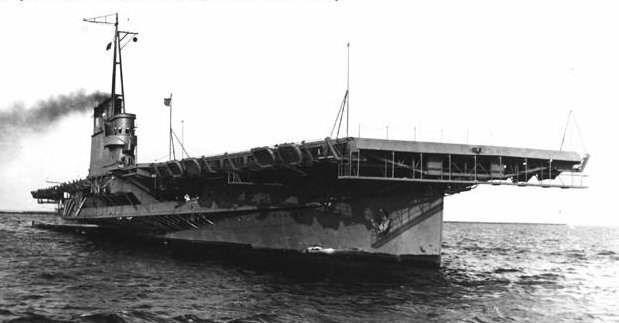 The Navy decommissioned USS Wolverine (IX-64) in 1945 and sold it for scrap in 1947. USS Wolverine (IX-64) underway in Chicago harbor, 22 August 1942. 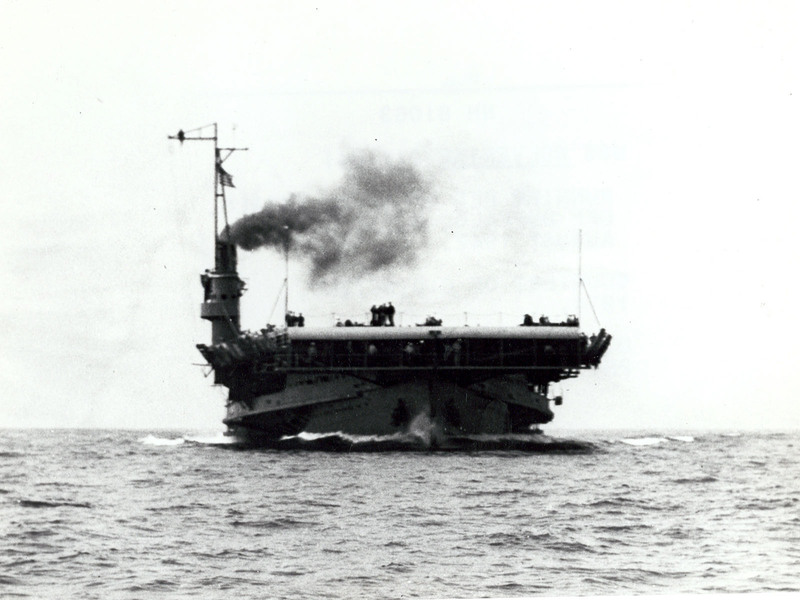 Along with having side paddle wheel propulsion, the USS Wolverine and USS Sable training carriers used coal-fired boilers to power their mighty steam engines rated at 12,000 ihp. 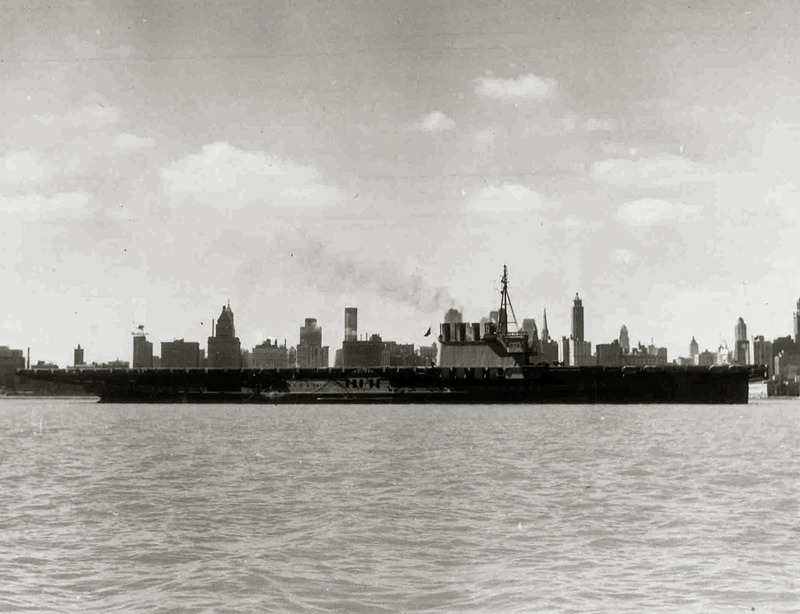 USS Wolverine (IX-64) lying at anchor with Chicago skyline beyond. Stern end of the newly commissioned USS Wolverine (IX-64) training carrier in 1942. 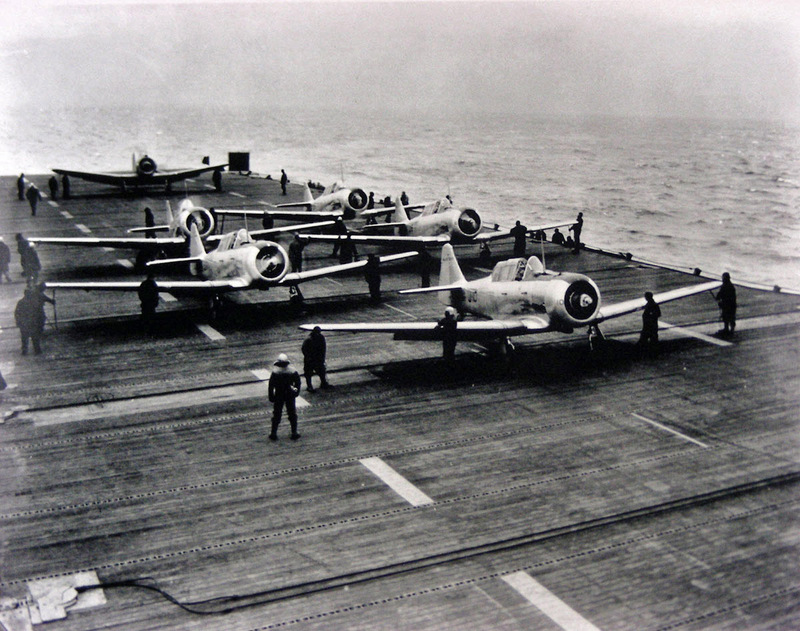 Naval aviators used these to become carrier qualified. USS Wolverine (IX-64) lying at anchor on Lake Michigan near Chicago showing starboard side, 06 April 1943. 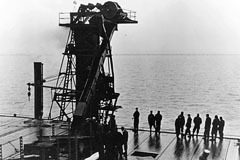 A collier is alongside with coal hoisting gear to refuel the training carrier, on Lake Michigan. 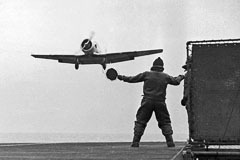 In 1941, prior to the beginning of World War II, the need to be able to train pilots in aircraft carrier takeoffs and landings became an area of concern. 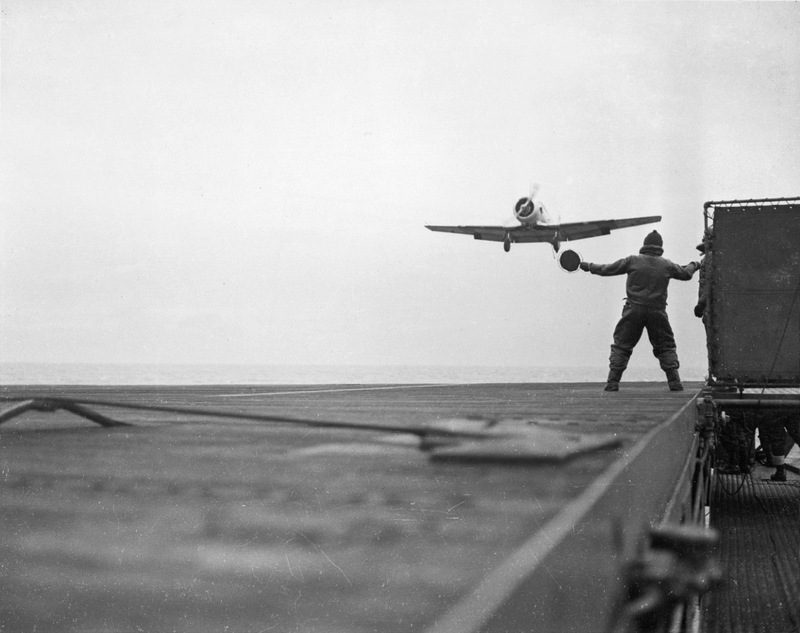 There were a limited number of aircraft carriers available and these were assigned to front line duties. 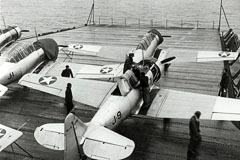 Commander Richard F. Whitehead made the initial proposal of converting lake steamers into training aircraft carriers but his idea was met with little interest. Following the Japanese attack on Pearl Harbor his proposal was fast tracked by Admiral Ernest J. King Chief of Naval Operations. 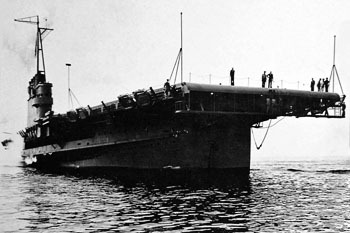 The option of using a lake steamer decided upon for a number of reasons including that a new ship wouldn't have to be built scratch which would free up resources for other ship production and that a suitable size ocean vessel or an existing aircraft carrier were too wide to fit through the Welland Canal. Drawings of aircraft training carrier USS Wolverine. 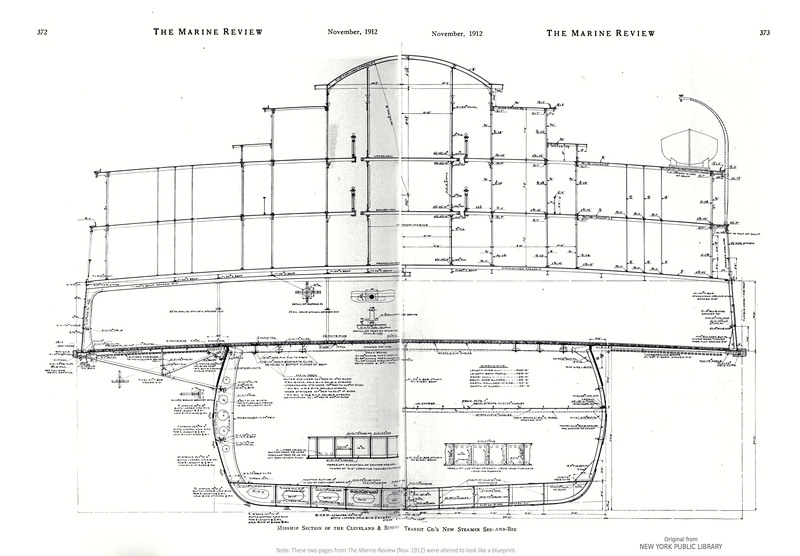 Original drawings by American Ship Building Company from 1942. Touchup in 2018 by Stacy. 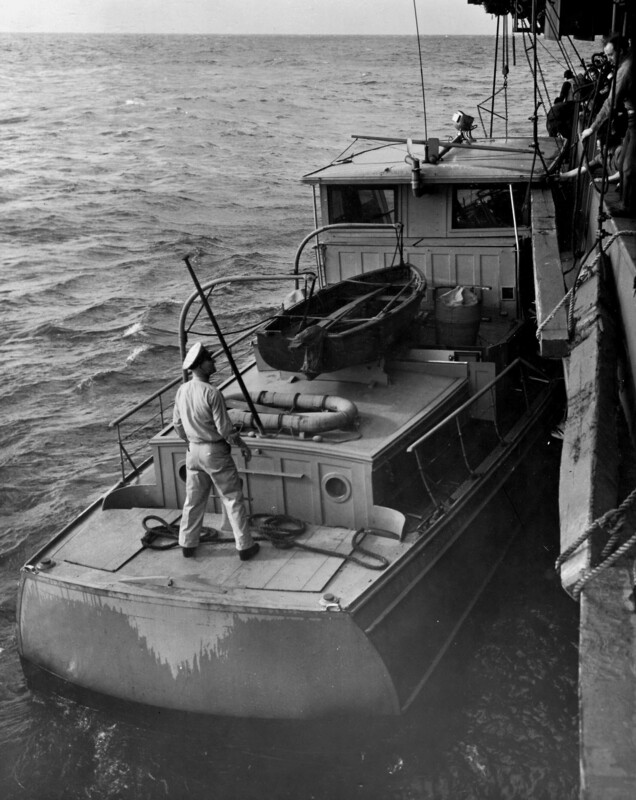 The Navy acquired Seeandbee from the C&B Transit Company on 12 March 1942 for the price of $756,500 and designated her an unclassified miscellaneous auxiliary vessel IX-64. 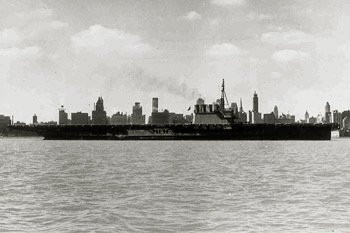 Seeandbee's existing superstructure was removed at Cleveland, Ohio and the ship was towed to Buffalo to undergo refitting by the American Shipbuilding Company. 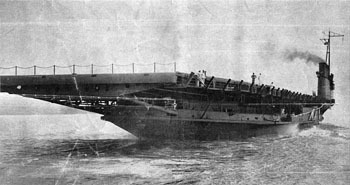 From 6 May 1942 a 550 ft long wooden flight deck was installed, a new bridge island was built, arresting cables installed, the funnels rerouted to the starboard side of the ship along with other modification. 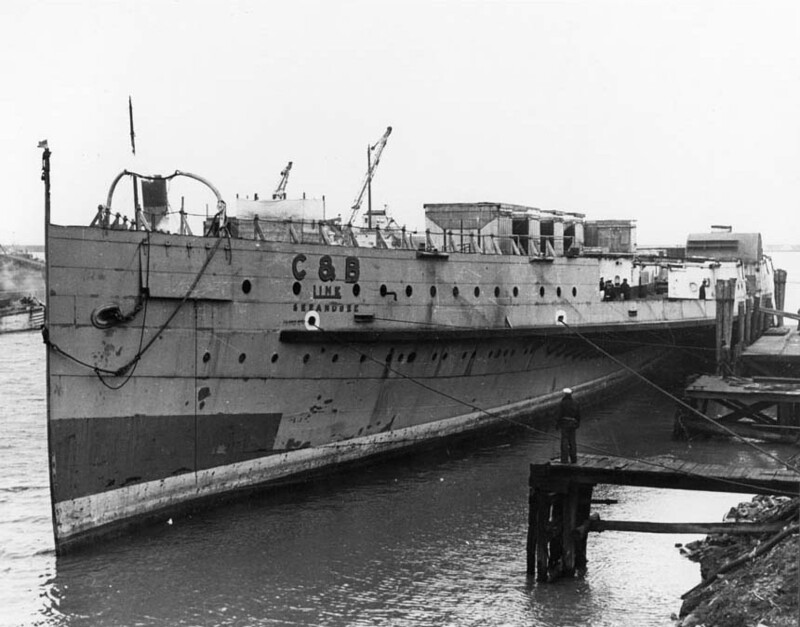 Unable to fit in a dry dock due to its size, the refit was done while the ship was afloat. 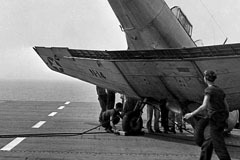 At its peak a crew of 1,250 men worked round the clock and it was reported that 45 miles of welding as well as 57,000 bolts with washers and grommets were used during the refit operations. A Coast Guard substation was set up to provide security for the work and no pedestrians or vehicles were allowed near the work site. 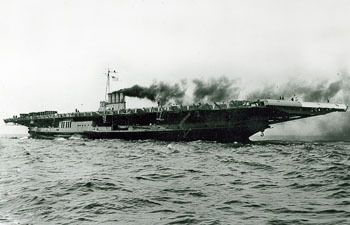 The name Wolverine was approved on 2 August 1942 with the ship being commissioned on 12 August 1942 at Buffalo, New York with Commander G. R. Fairlamb in command. 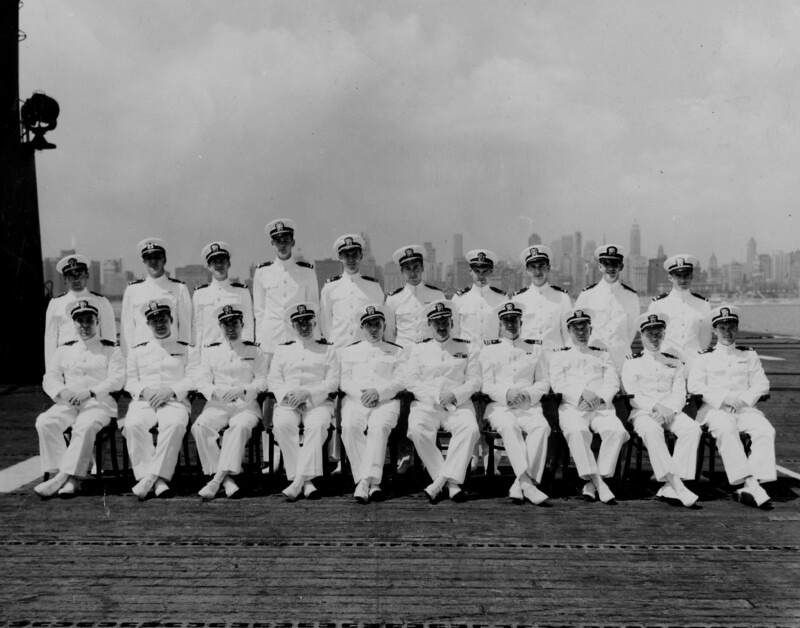 The commissioning ceremony was closed to the public and was attended by only certain dignitaries, the new crew and roughly five hundred workmen who were still on board. 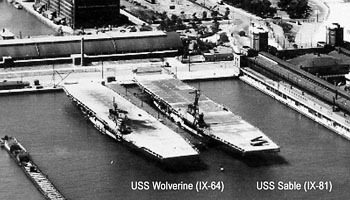 Intended to operate on Lake Michigan, IX-64 received her name because the state of Michigan is known as the Wolverine State. 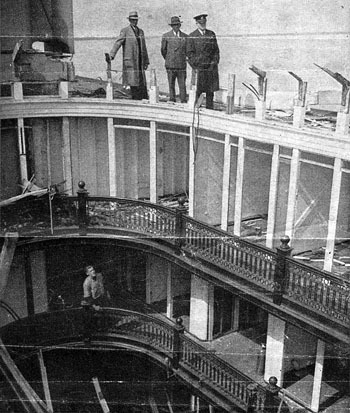 Seeandbee's elaborate atrium and staterooms all being stripped during steamer's conversion to US Navy training carrier USS Wolverine. 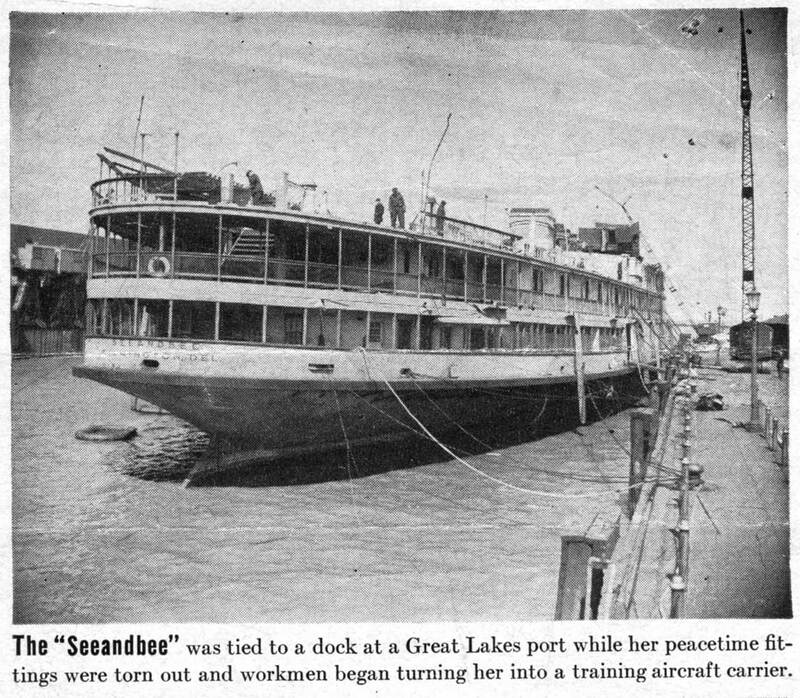 Seeandbee tied to dock at shipyard in Buffalo, NY, where 30-year-old excursion steamer was stripped bare before flight deck was added. USS Wolverine undergoing official trials near Buffalo, New York. 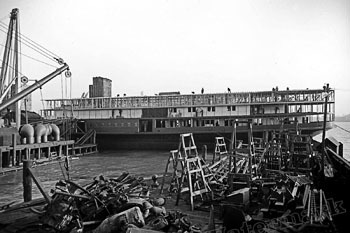 The former Great Lakes steamer Seeandbee, looking desolate, as wrecking crews begin to strip her bare to the gunwales in Cleveland, Ohio in summer of 1942. Visible are the two intakes in front of smoke stack atop a boiler uptake casing (one of four). 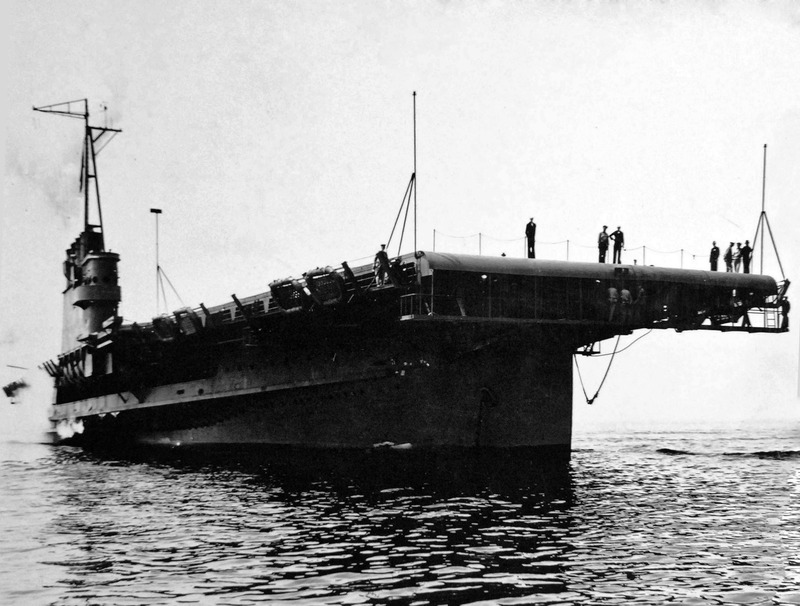 The hull was towed to Buffalo, NY for conversion where it was transformed into an aircraft carrier. 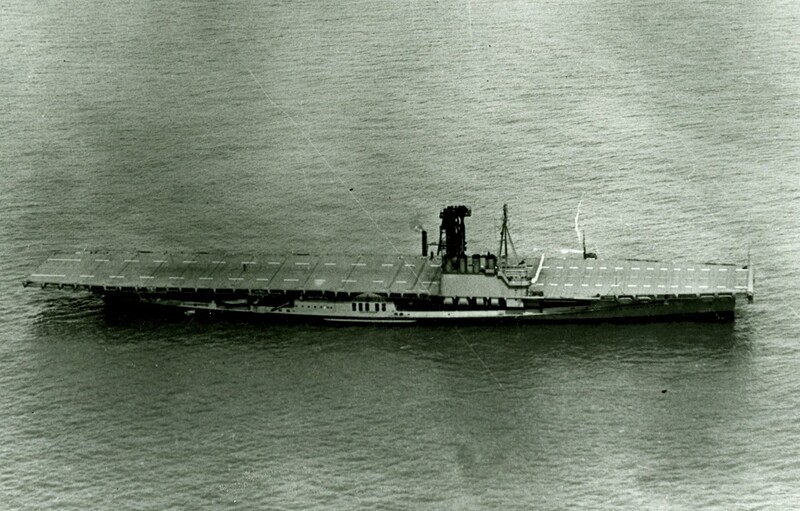 Looking more like a carrier, Seeandbee's conversion to USS Wolverine (IX-64) shown on 12 June 1942. 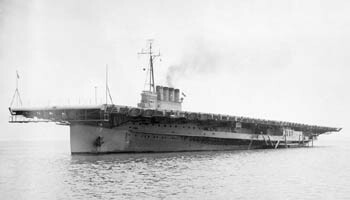 The Navy acquired the side-wheel steamer on 12 Mar 1942 and designated her an unclassified miscellaneous auxiliary ship, IX-64; conversion began on 6 May 1942. USS Wolverine (IX-64) moored at Buffalo, NY, probably taken during its commissioning on 12 Aug 1942. 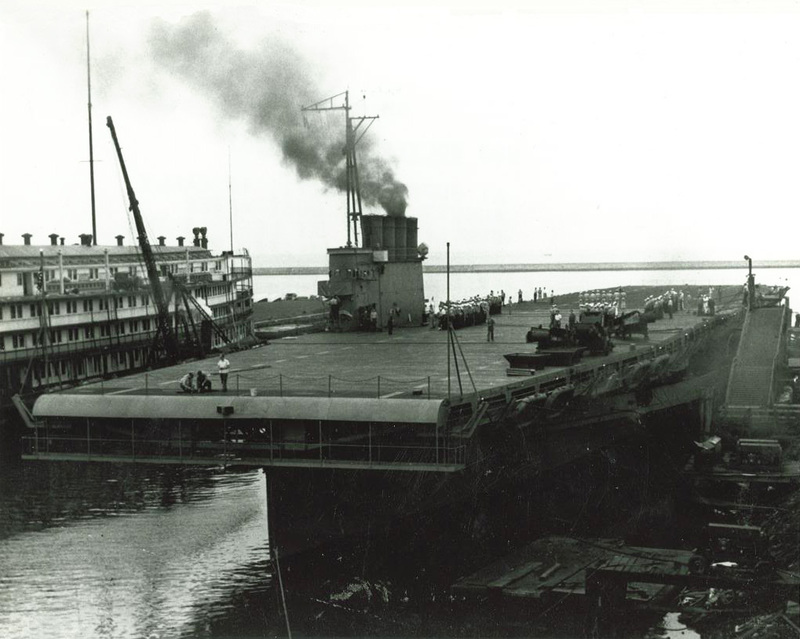 To its left is steamer Greater Buffalo, just beginning its conversion to USS Sable (IX-81). 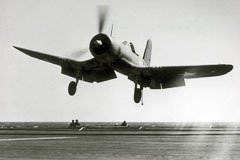 Wolverine began her new assignment in January 1943 stationed at Chicago, Illinois at what came to be called Navy Pier, assigned to the 9th Naval District Carrier Qualification Training Unit. Her sister ship, USS Sable, joined Wolverine in May 1943 and the two ships began to be casually referred to as the "Corn Belt Fleet". 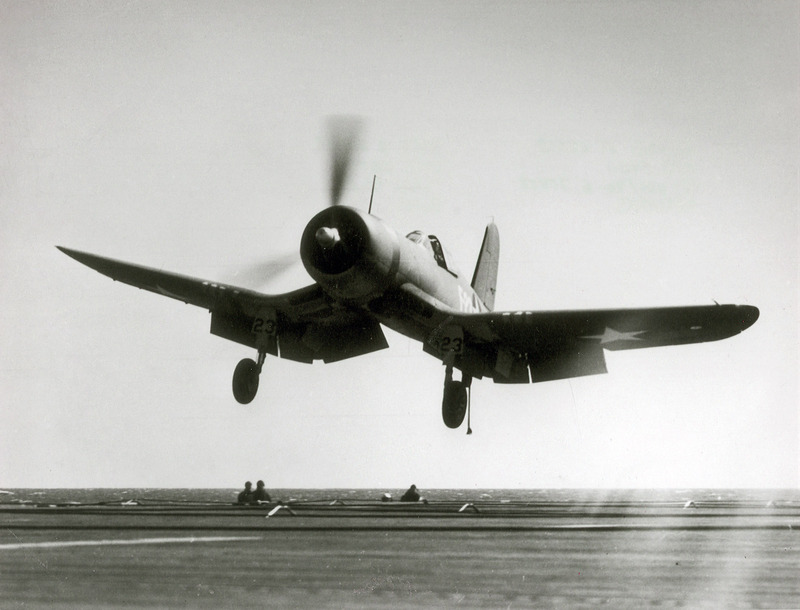 By 7 May 1943 it was reported that the 7,000th successful landing had been made on Wolverine. 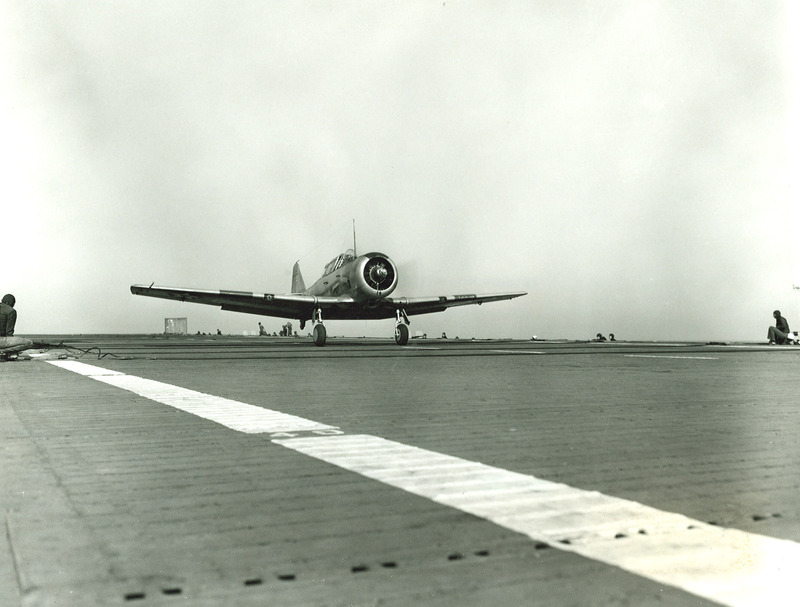 In conjunction with NAS Glenview, the two paddle-wheelers afforded critical training in basic carrier operations to thousands of pilots and also to smaller numbers of Landing Signal Officers (LSOs). 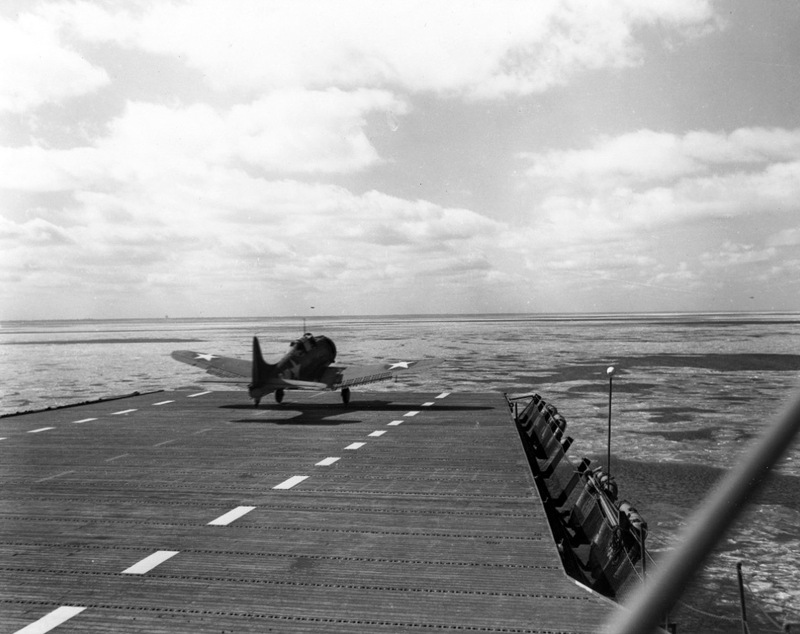 Wolverine and Sable enabled the pilots and LSOs to learn to handle take-offs and landings on a real flight deck. 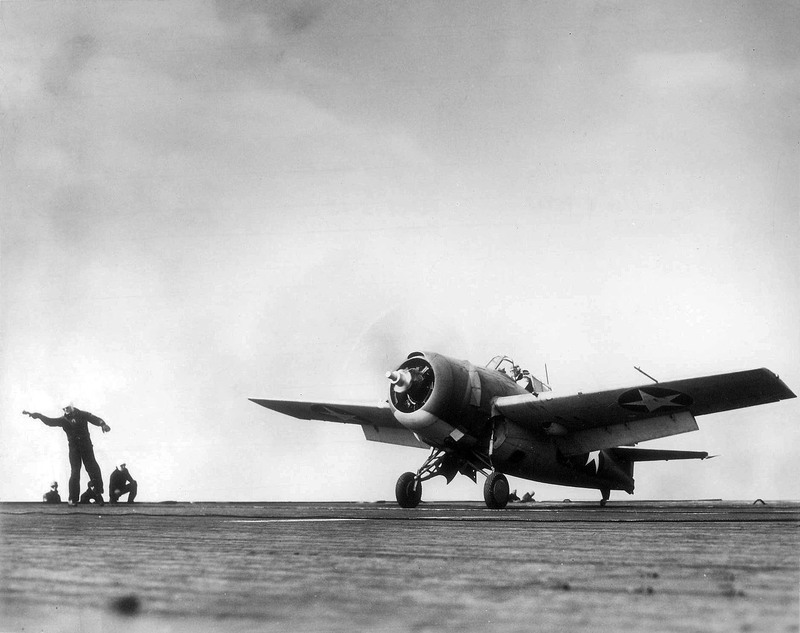 Sable and Wolverine were a far cry from front-line carriers, but they accomplished the Navy's purpose: qualifying naval aviators fresh from operational flight training in carrier landings. 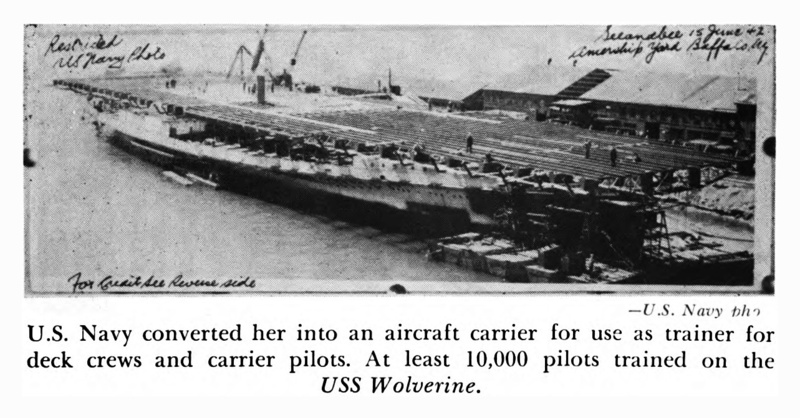 Wolverine and Sable were not true aircraft carriers and they had certain limitations. 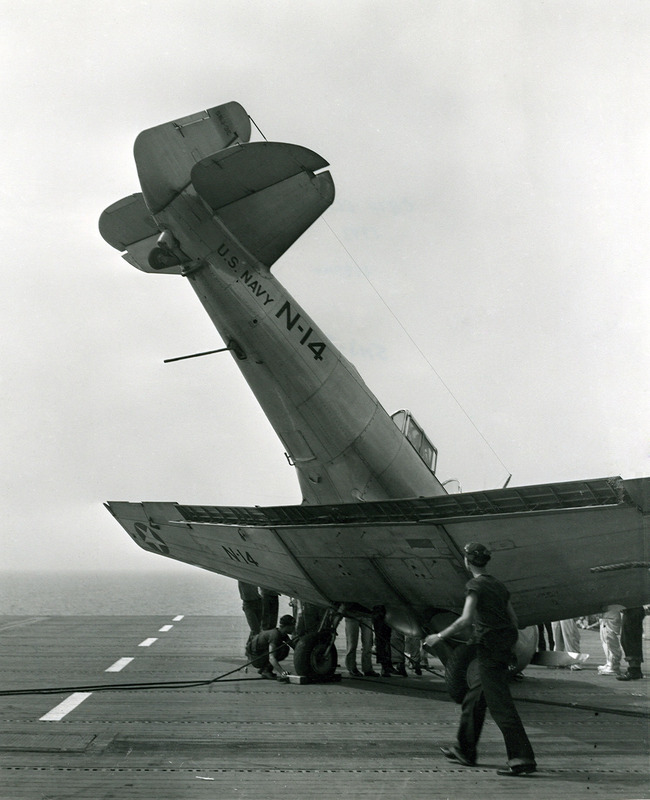 One was that there were no elevators or hangar decks to store damaged aircraft. 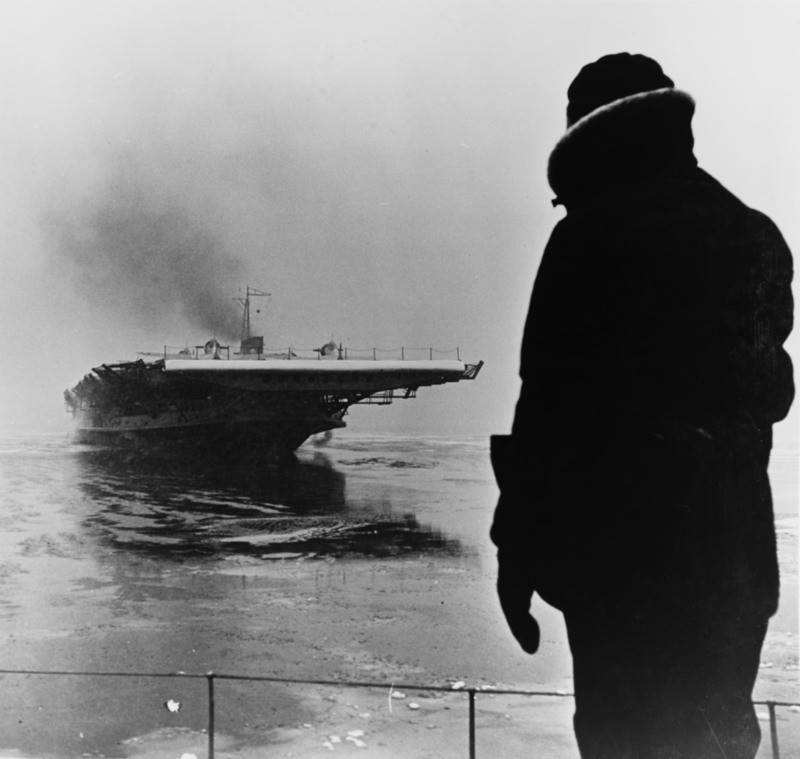 If all the storage spaces on the flight deck were filled with damaged aircraft, the day's operations were over and the carriers headed back to their pier in Chicago. 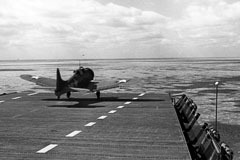 Landing aircraft on calm days became another problem for the carriers. 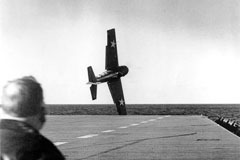 Both carriers couldn't generate sufficient speed to meet the "wind over deck" (WOD) landing minimums for aircraft such as F6F Hellcats, F4U Corsairs, TBM Avengers and SBD Dauntlesses. 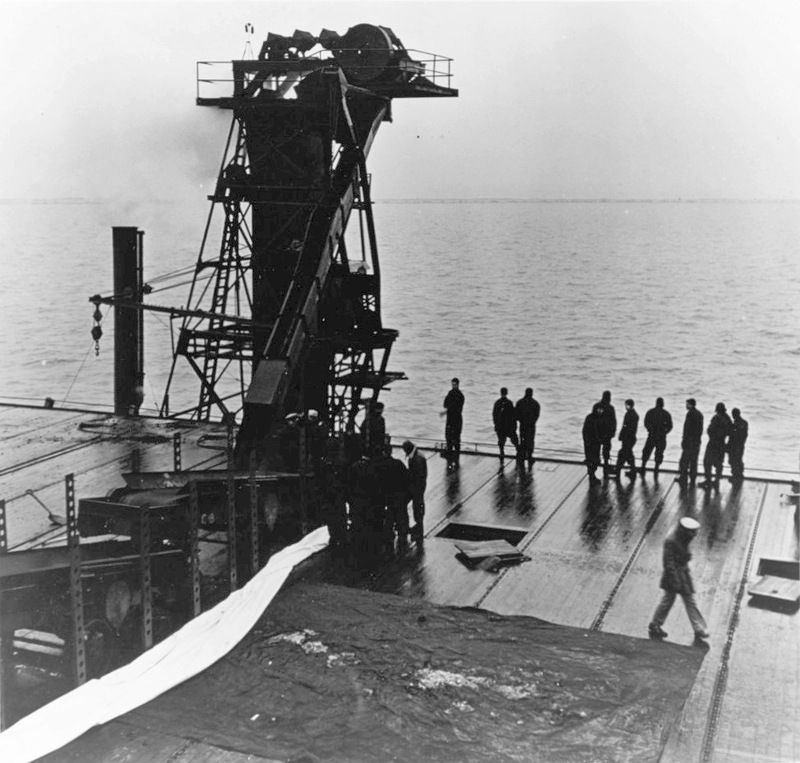 When there was little or no wind on Lake Michigan, operations often had to be curtailed. 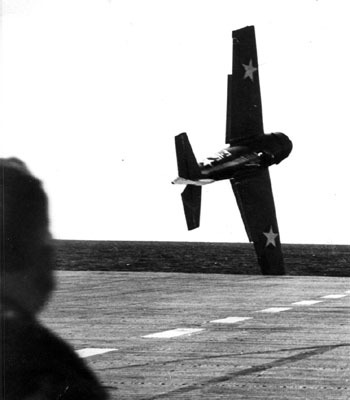 Occasionally, when low-wind conditions persisted for several days and the pool of waiting aviators started to bunch up, the Navy turned to an alternate system of qualifications. 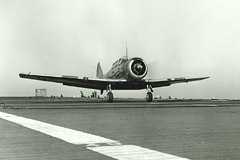 The pilots qualified in SNJ Texans - even though most pilots had last flown the SNJ four or five months earlier. 02 Mar 1942 US Navy acquired excursion steamer Seeandbee. 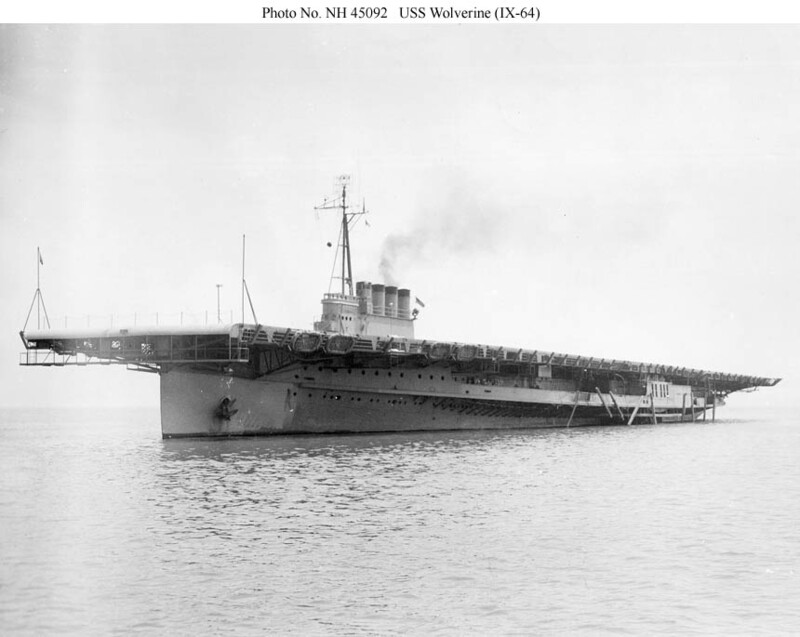 02 Aug 1942 US Navy approved the new name Wolverine for the fresh water aircraft carrier recently converted from excursion steamer Seeandbee. 12 Aug 1942 USS Wolverine commissioned into service with CDR. 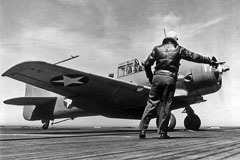 George Richardson Fairlamb, Jr. in command. 07 Nov 1945 USS Wolverine was decommissioned from service. 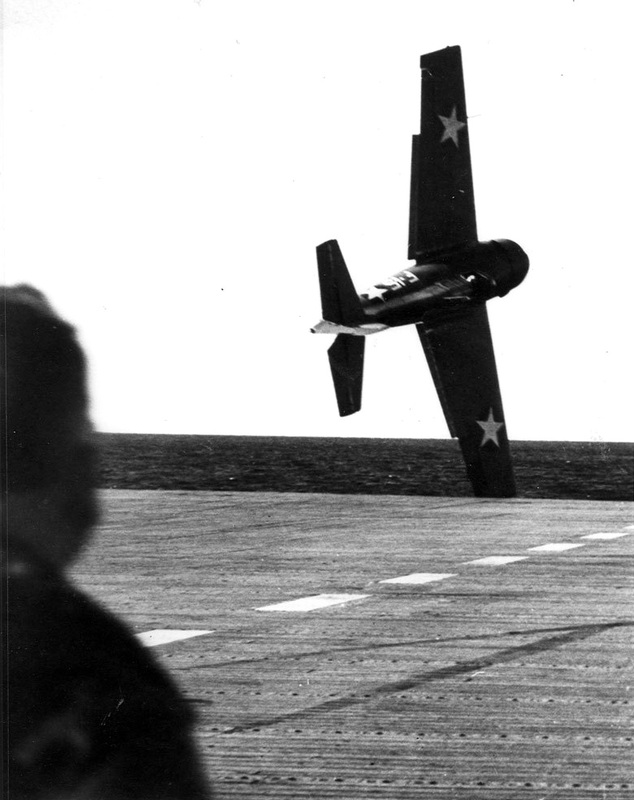 28 Nov 1945 Wolverine struck from the US Naval Vessel Register. 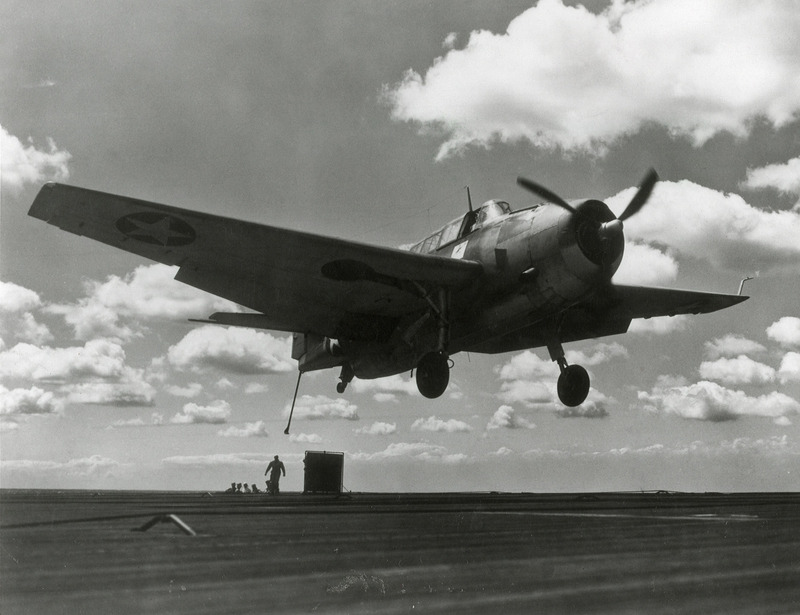 26 Nov 1947 Wolverine transferred to Maritime Commission for disposal. 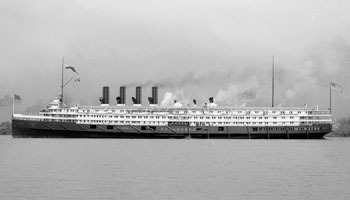 The USS Wolverine (IX-64) was one of two refitted coal-fired, side paddlewheel passenger steamers converted into training carriers, which operated on Lake Michigan. 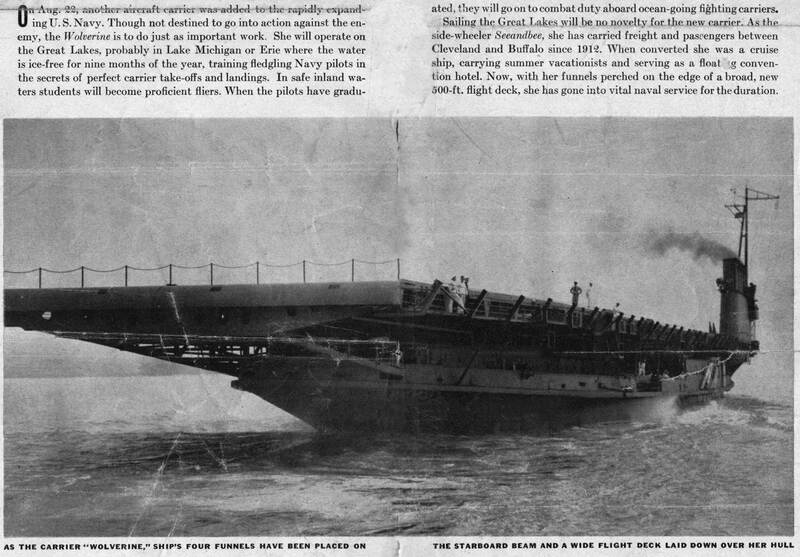 Shown here shortly after her conversion from Great Lakes passenger liner Seeandbee. When at anchor, Wolverine would raise her radio masts, as witnessed by the two masts on her bow round-down. 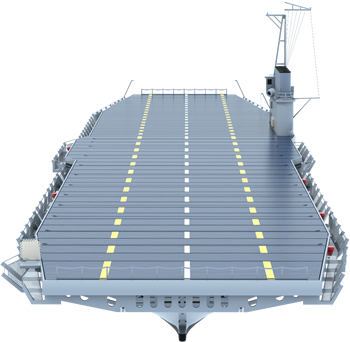 Two thirds of the way down each side are the paddlewheel boxes which propelled the training carrier. 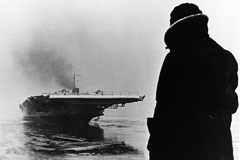 Wolverine in front of the Chicago skyline on Mar 22, 1943, shortly after beginning her assignment. 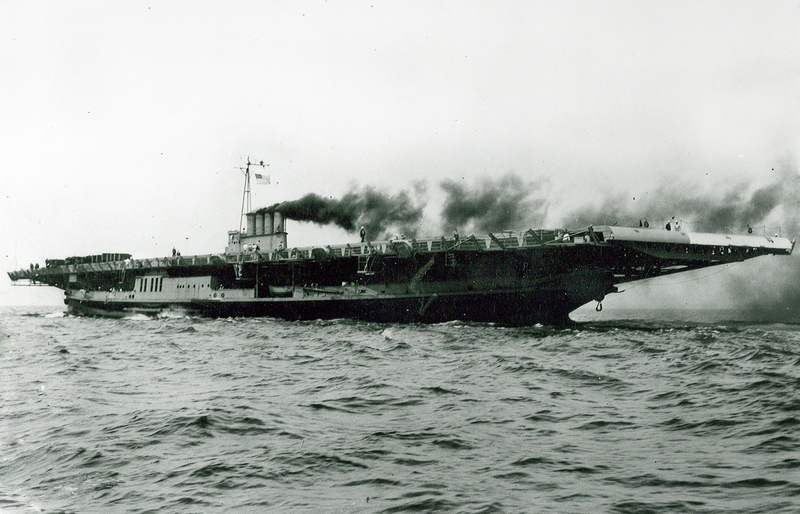 USS Wolverine (IX-64) emitting black soot from her coal-fired boilers while underway on Lake Michigan in 1943. 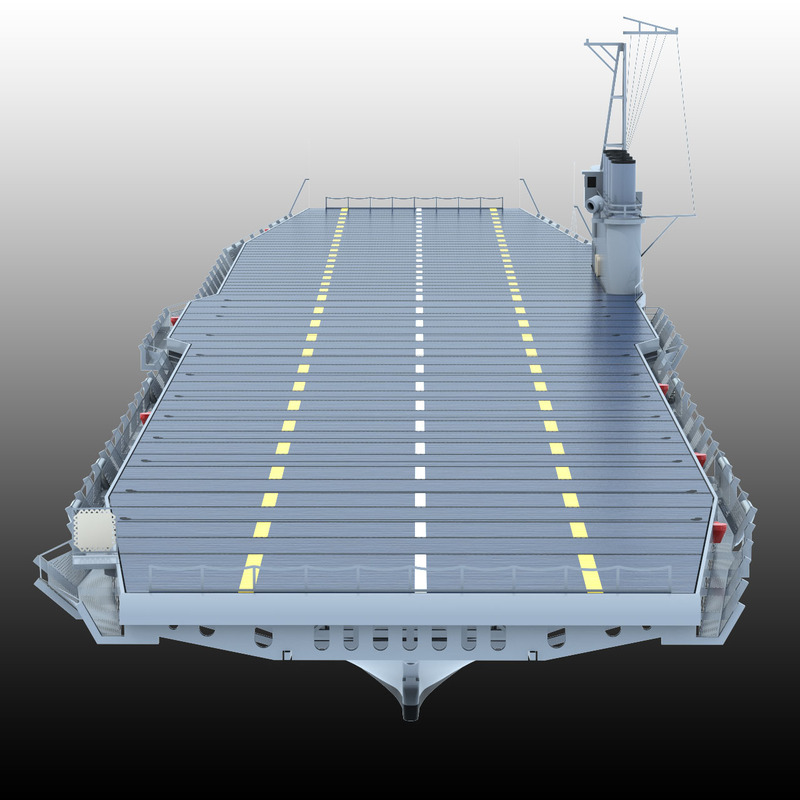 A CAD 3D rendering of USS Wolverine IX-64 and its ramp, which is the beginning of the flight deck at the stern of the carrier. 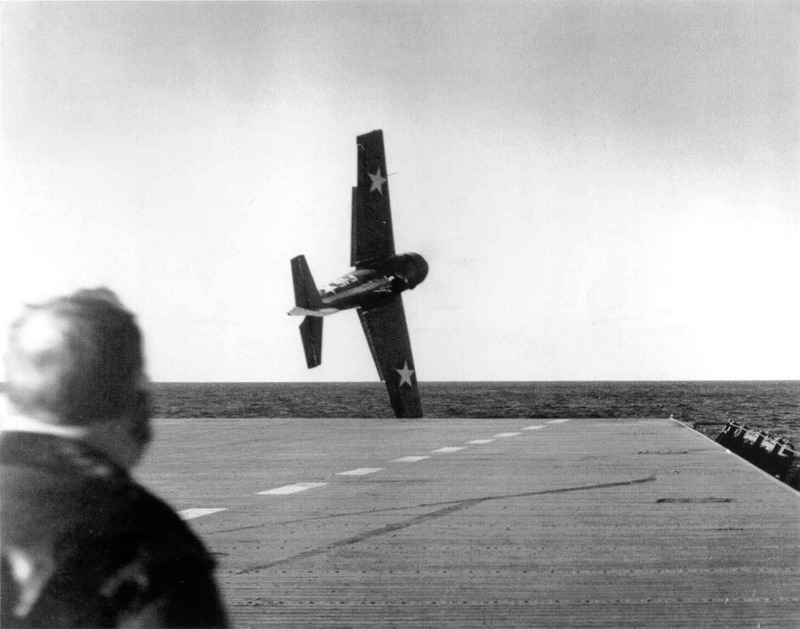 This view is similar to that seen by naval air cadets attempting to land their planes during carrier qualification training. 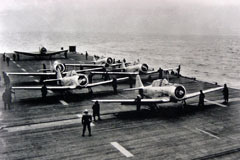 These training carrier exercises took place on Lake Michigan between 1942 and 1945. CAD 3D rendering showing Wolverine's stern end and starboard side. Once the war was over, the need for such training ships also came to an end. 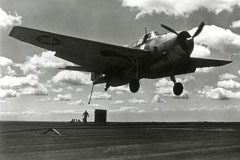 The Navy decommissioned Wolverine on 7 November 1945; three weeks later, on 28 November, she was struck from the Naval Vessel Register. 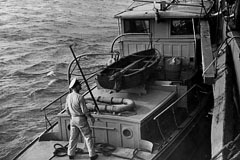 USS Wolverine (IX-64) was then transferred to the War Shipping Administration on 14 November 1945. 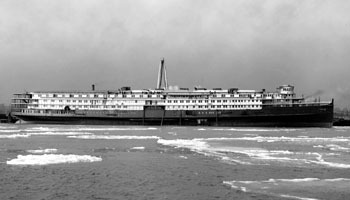 The ship was offered to U.S. citizens for either U.S. flag operation or scrapping and sold 21 November 1947 to A. F. Wagner Iron Works of Milwaukee, Wisconsin for $46,789 to be scrapped. Its sister ship, USS Sable (IX-81), was also decommissioned about same time and sold for scrap. 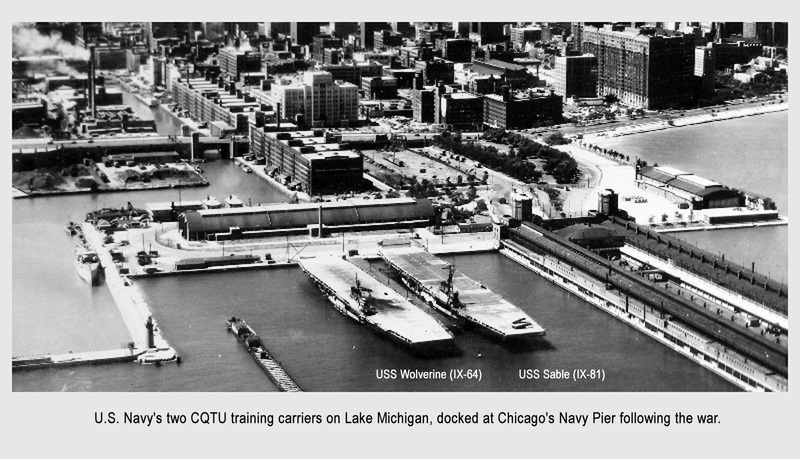 Both aircraft training carriers backed into dock at Chicago's Navy Pier. 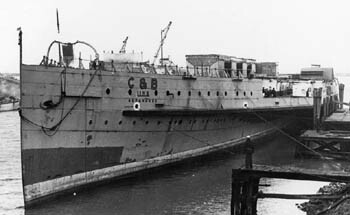 Decommissioned after the war in 1945, and later sold for scrap in 1947. Final Disposition: Milwaukee, WI Lake Michigan, 21 Nov 1947, sold for scrapping. Other Facts: Named in contest as acronym for C & B Line. Largest passenger ship when launched. Only four stacker ever to sail Great Lakes. Too big for Soo Locks & Welland Canal; confined to Lakes Erie, Huron & Michigan. 1939 Leased Cleveland & Buffalo Steamship Company, Chicago, Illinois. 1941 Owned Cleveland & Buffalo Steamship Company. 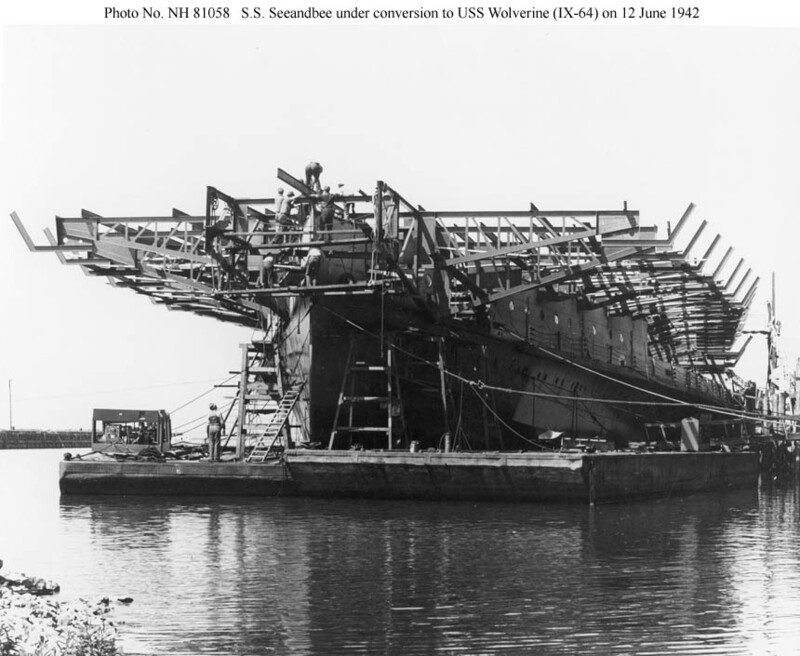 1942 Acquired by U.S. Navy, Washington, D.C. and renamed USS WOLVERINE (IX-64); stripped to deck at Cleveland, Ohio. 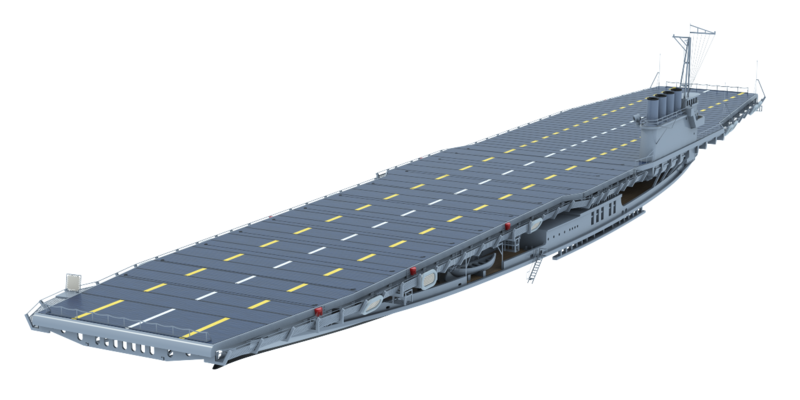 Converted to training aircraft carrier at Buffalo, NY, with deck 103' wide x 550' long. 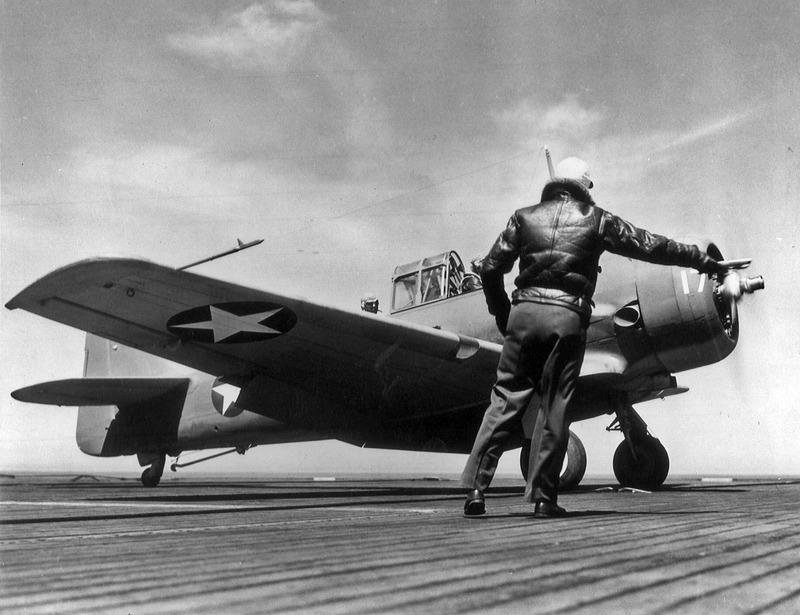 1942-46 Operated out of Chicago with planes based at Glenview Naval Air Station; over 70,000 landings & take-offs. 1947 Owned A.F. Wagner Iron Works, Milwaukee, Wisconsin; scrapped. 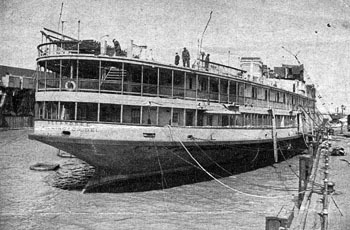 The Great Lakes passenger streamer Seeandbee, as-built for the Cleveland and Buffalo Transit Company (C & B Line), is moored pierside in August 1919. 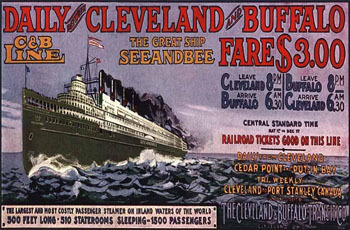 Seeandbee, intended for overnight passenger service between Cleveland and Buffalo, was designed by naval architect Frank E. Kirby for the Cleveland and Buffalo Transit Company (C&B) of Cleveland, Ohio. Two basic features were utilized in the ship's design as an overnight, luxury passenger service for those wanting a good night's sleep. Side-wheel paddle propulsion was selected because it allowed more area over the paddle boxes for cabins and decks, also it increased maneuverability and stability in rough weather over screw-type propellers. 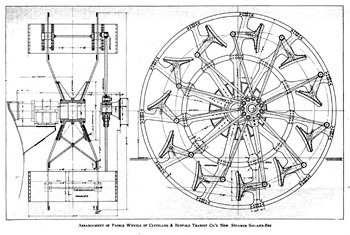 Secondly, the more expensive and much heavier compound inclined steam engine was chosen due to its ability to develop 12,000 horsepower at low revolutions (about 30 rpms) without the vibration associated with the higher revolutions required by lighter vertical types for similar power. The ship (hull no. 190) was built by the Detroit Shipbuilding Company, soon to be acquired and renamed American Ship Building Company, of Wyandotte, Michigan. 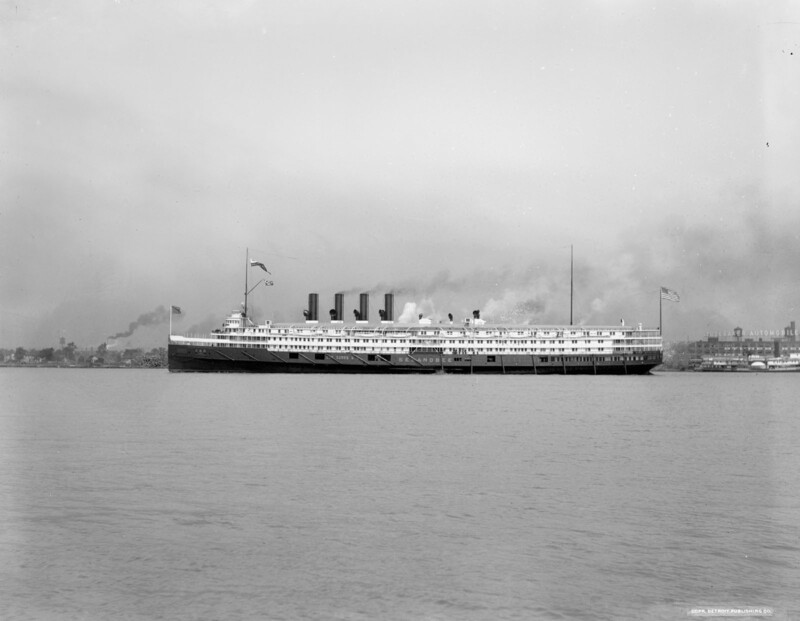 Seeandbee, the largest side-wheel steamer in the world at the time, was launched November 9, 1912. 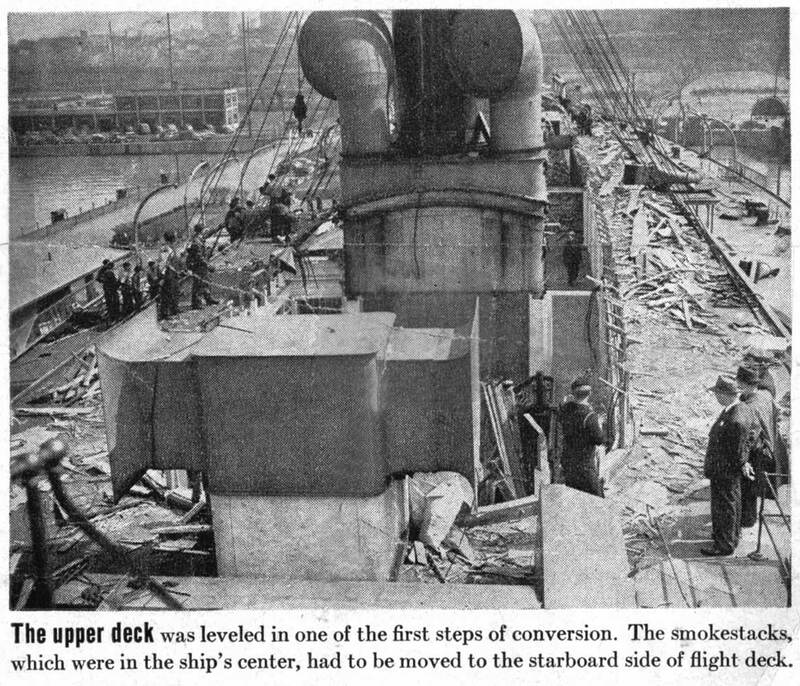 According to the Interstate Commerce Commission the ship's tonnage (displacement) was 6,381 GRT and 1,500 DWT. 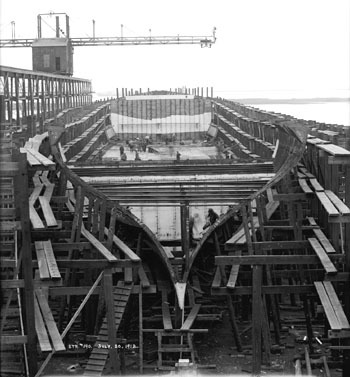 The ship's dimensions as built were 500'-0" length overall, 485'-0" between perpendiculars, 58'-0" molded hull beam, 97'-8" extreme beam over guards with extreme depth of hull at stem being 30'-4" and 23'-6" molded depth. 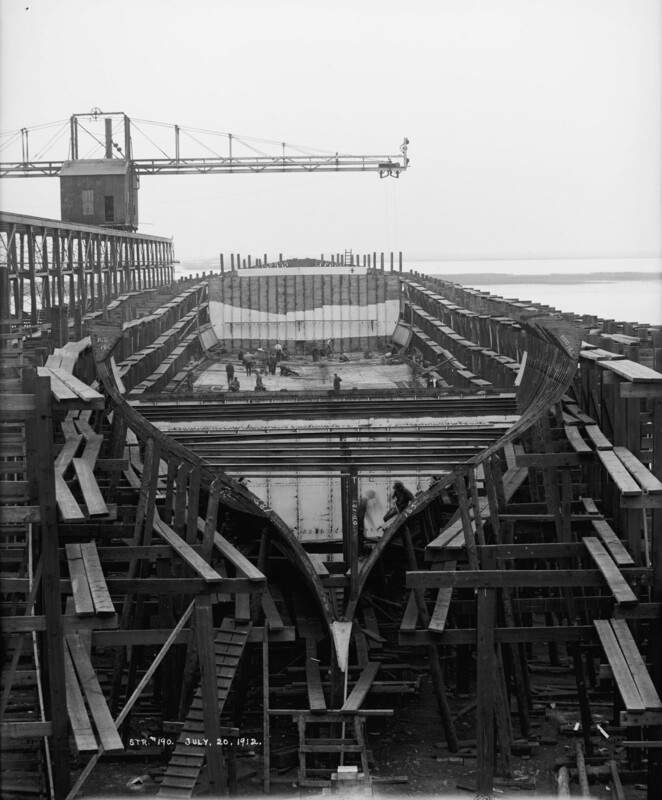 The hull was entirely steel with a double bottom extending almost 365' feet containing water ballast and divided lengthwise with a watertight bulkhead and by transverse bulkheads into fourteen compartments. 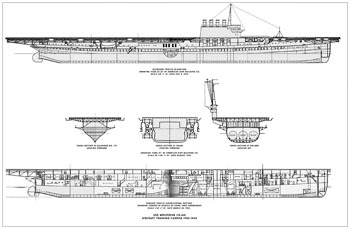 Above that 3'-0" ballast compartment the ship was divided by eleven watertight bulkheads extending from keel to main deck with hydraulic doors operated from the engine room. In total there were seven decks: tank top, orlop, main, promenade, gallery, upper and dome. 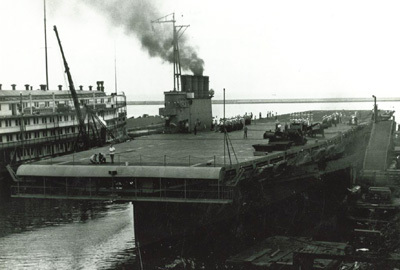 Steel was used to the promenade deck with fire protection for beams above that level and fireproof doors provided compartmentalization and steel fire curtains in cargo spaces. For fire alarm purposes the vessel was divided into fifty sections with fire hydrants spaced so that permanently attached hoses reached every point in the vessel and an extensive sprinkler system. 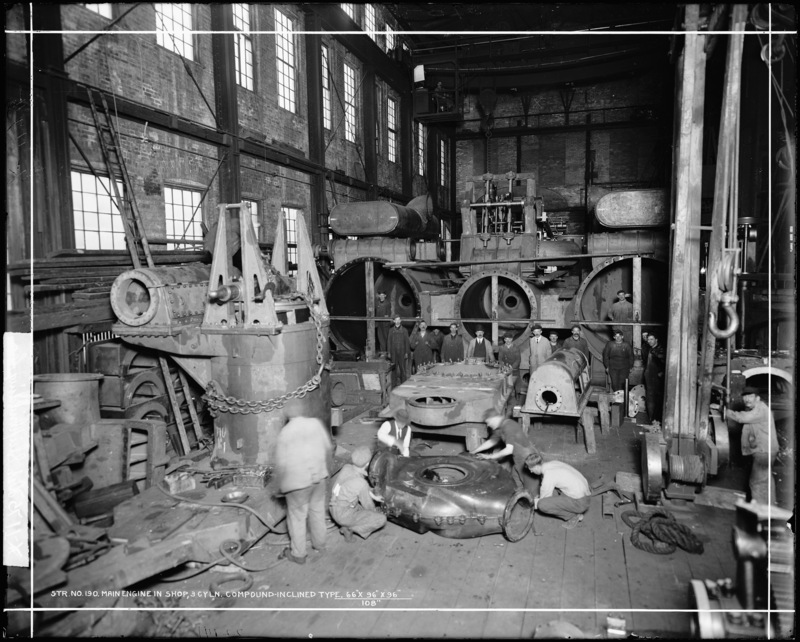 Seeandbee's main engine in shop, 3-cylinder compound-inclined type 66" x 96" x 96" / 108" (bores/stroke). Two men are standing inside each 8 ft dia. cyl. bore. The steam engine rated at 31 rpm, takes 1.03 seconds for each piston to travel the 9 ft stroke. 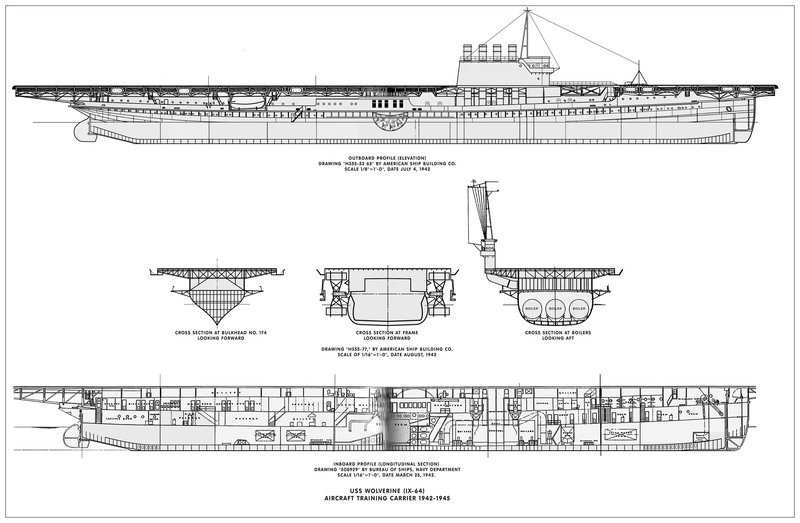 Propulsion was by an inclined, three cylinder steam engine below the main deck with only the main bearing tops, upper parts of the valves and handling levers above the main deck. The engine was unique in using a Walschaert gear, normally used on locomotives, to drive a Corliss gear for the two low pressure cylinders and the poppet type valves on the high pressure portion. The speed guarantee of 22 miles per hour was met by the engine's indicated horsepower of 12,000 ihp (8,900 kW) at 31 revolutions per minute. The high pressure cylinder, 66 in. (5'-6") in diameter, was centered between the two low pressure cylinders of 96 in. 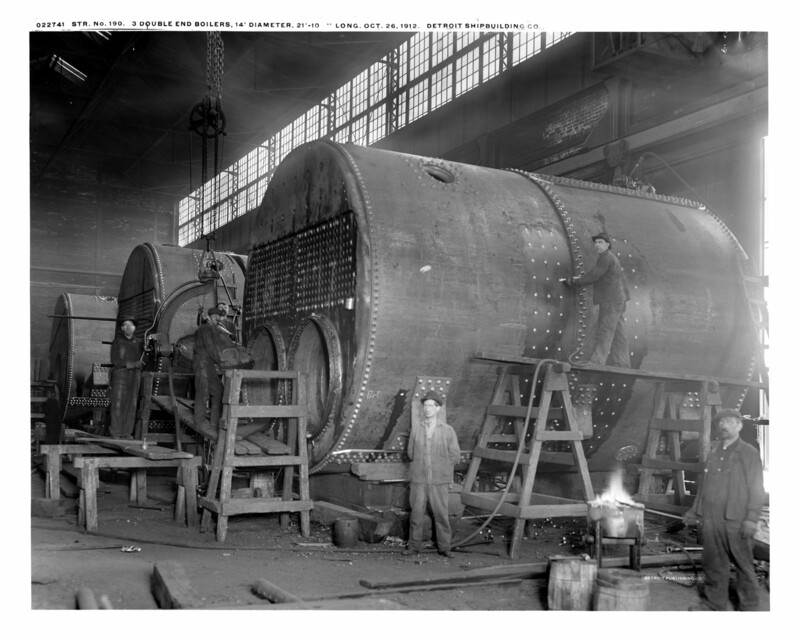 (8'-0") diameter with steam provided by six single-ended and three double-ended Scotch boilers forward of the engine room delivering steam at 165 pounds per square inch. 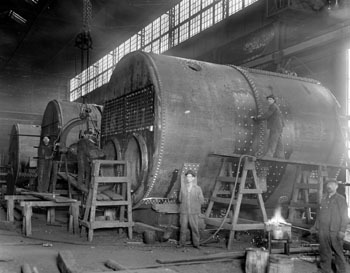 The single ended boilers were 14'-0" inside diameter by 10'-6" length, and the double-ended boilers were 14'-2 3/16" mean diameter by 20'-5 1/2" length. Seeandbee's three double-ended coal-fired Scotch marine boilers inside D.S.Co. 's fabrication shop. Each boiler measures 14'-0" diameter by 21'-10" long. 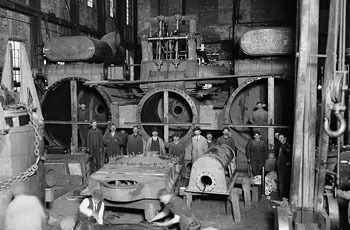 Six single-ended boilers were also fabricated for the ship. 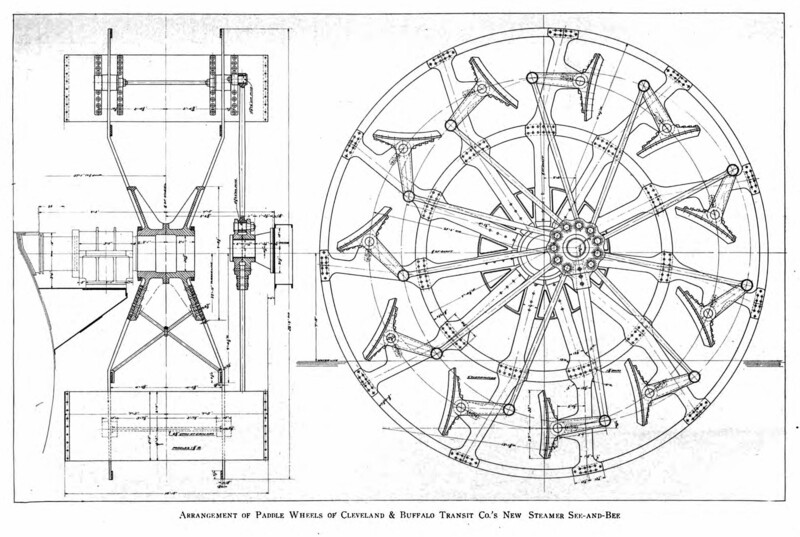 The two 32'-9" diameter paddle wheels each had eleven steel buckets 14'-10" long by 5'-0" wide. 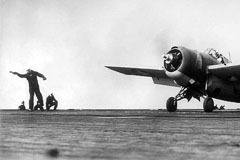 Due to the restricted channels at both Cleveland and Buffalo additional maneuvering capability was required and a bow rudder and steam steering engine were provided. 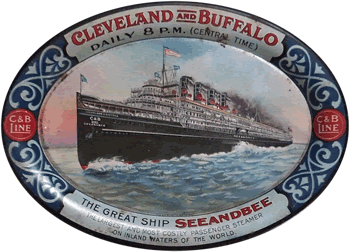 Arrangement of Paddle Wheels of Cleveland & Buffalo Transit Co.'s new steamer Seeandbee. 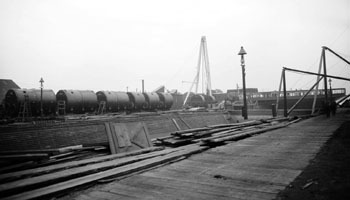 Nov 1912. 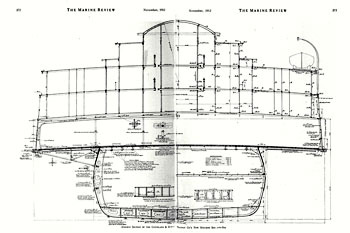 The Marine Review. p 369. Passengers were accommodated in 510 rooms of which 424 were regulation, 62 were fitted with private toilets and 24 were "parlors en suite" giving sleeping room for 1,500 persons and capable of carrying a total of 6,000 passengers and 1,500 tons of cargo loaded on the main deck. Passengers boarded through a mahogany paneled lobby with a Tuscan theme having steward's and purser's offices, telephone booths and a stairway to the promenade deck protected by a vestibule with sliding doors. 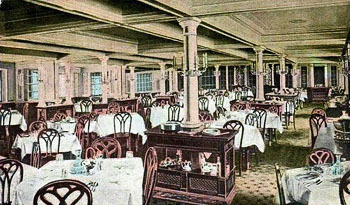 Aft, extending to the stern, was the main dining room paneled in mahogany and white enamel with a banquet room on the starboard side and two private dining rooms to port. Alcoves with bay windows provided some relatively private dining areas in the main dining room. Stairs led to a buffet of old English tavern decor below the dining room. 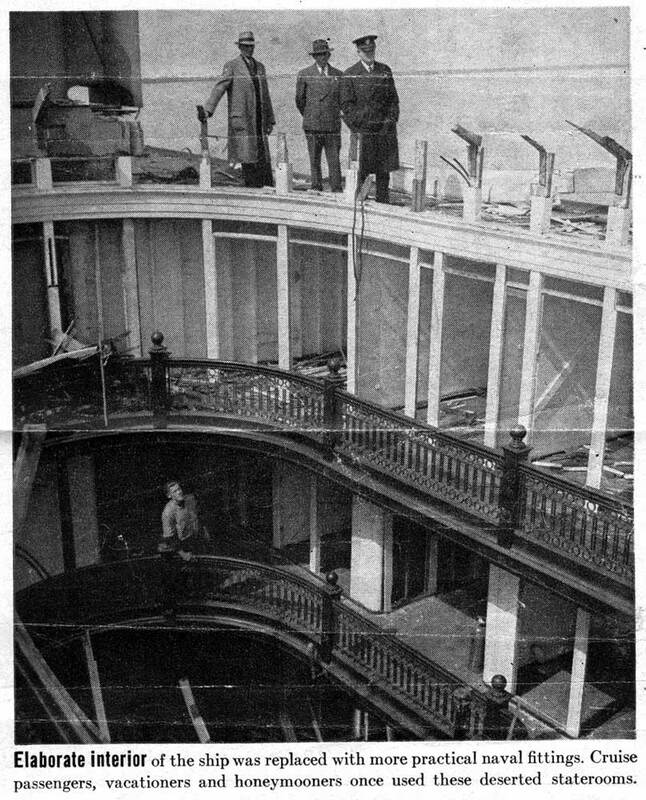 A feature of the vessel was the main saloon on the promenade deck that extended almost 400 ft (121.9 m) in length subdivided into sections with a book shop, flower booths, observation room and men's and ladies writing rooms. A number of private parlors, each of different design containing beds and private baths and balconies, were set off the main saloon and aft, in an arrangement designed so that it could be heard both in the saloon and above in the atrium and ladies drawing room, was a balcony for an orchestra. On the gallery deck was the ladies drawing room in Italian Renaissance style with built in seats and above, on the next deck, was an Atrium with sleeping rooms adjoining. 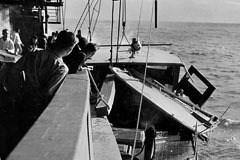 Amidships on the gallery deck was the lounge with seating and provision for light refreshments. Washed air ventilation units provided fresh air for all interior spaces with exhaust fans for removal of foul air. 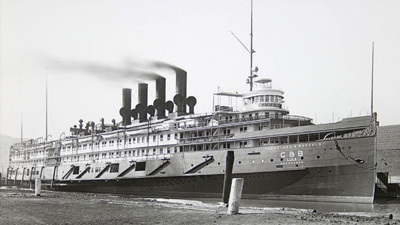 Three steam turbines drove generator sets for electricity for 4,500 electric lights, including the largest searchlight 32 inches on the Great Lakes, and the ship was extensively electrified for auxiliary functions. Over 500 telephones were aboard with one in every stateroom, officer's quarters and in booths in passenger areas as part of a public system and a private system for use in ship operations. 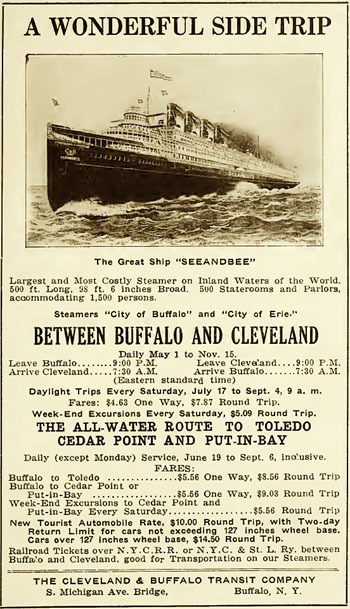 Seeandbee carried members of the Cleveland Chamber of Commerce to Buffalo on the maiden voyage with regular operations beginning from the East 9th Street pier in 1913. 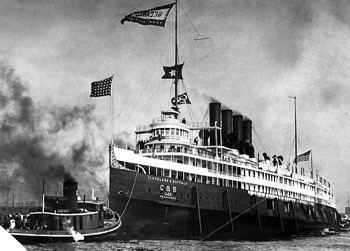 In addition to the scheduled operation between Cleveland and Buffalo the vessel made special cruises to Detroit and Chicago and in summer. 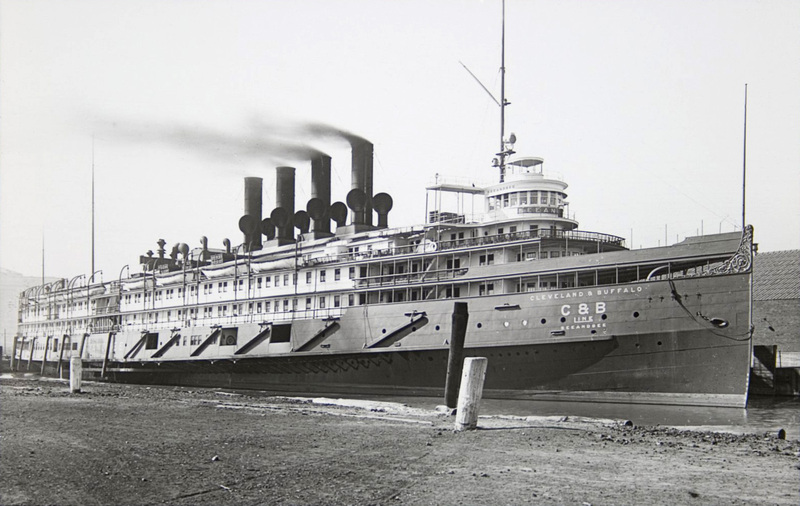 Due to heavy losses in 1938 Cleveland and Buffalo Transit was liquidated in 1939 with the vessel acquired by the Chicago based C&B Transit Company that operated the ship through 1941. 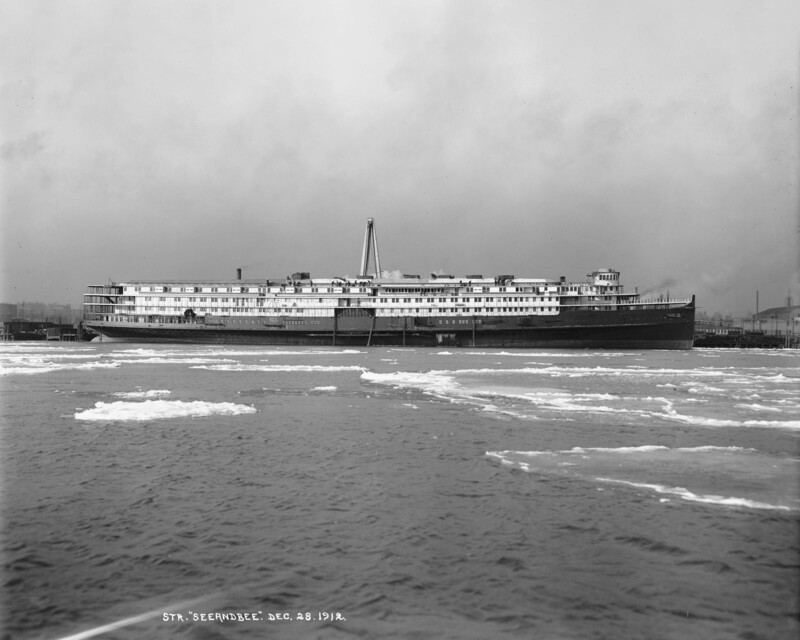 In its day, Seeandbee was the largest and most costly passenger steamer on inland waters of the world. 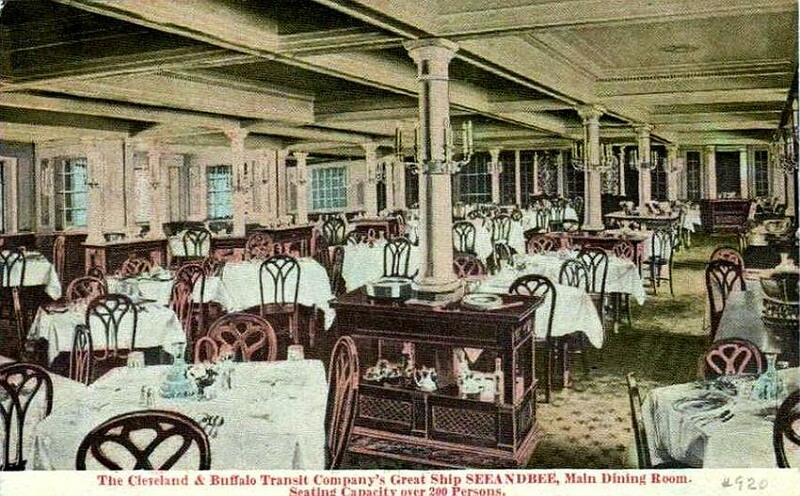 It was 500 feet long, had 510 staterooms with sleeping accommodations for 1,500 passengers. The steam ship Seeandbee (hull no. 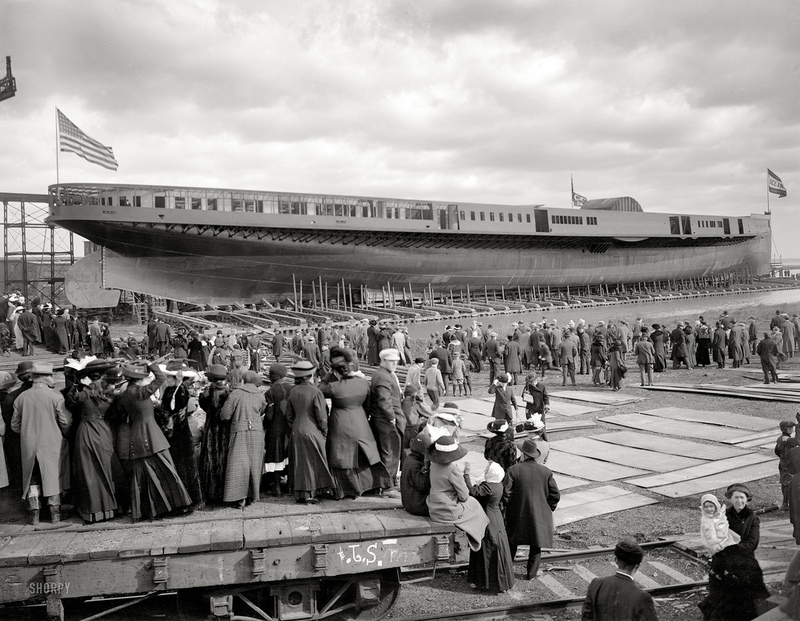 190) is under construction at the Detroit Shipbuilding Company's yard in Wyandotte, Michigan. 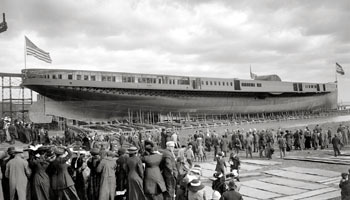 Starboard side with hull on the ways during ship's launch ceremony. 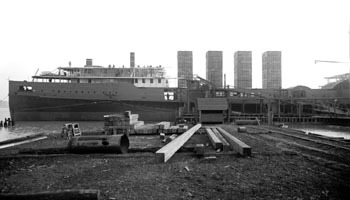 The steamer's two rounded side-paddlewheel boxes are located midship. 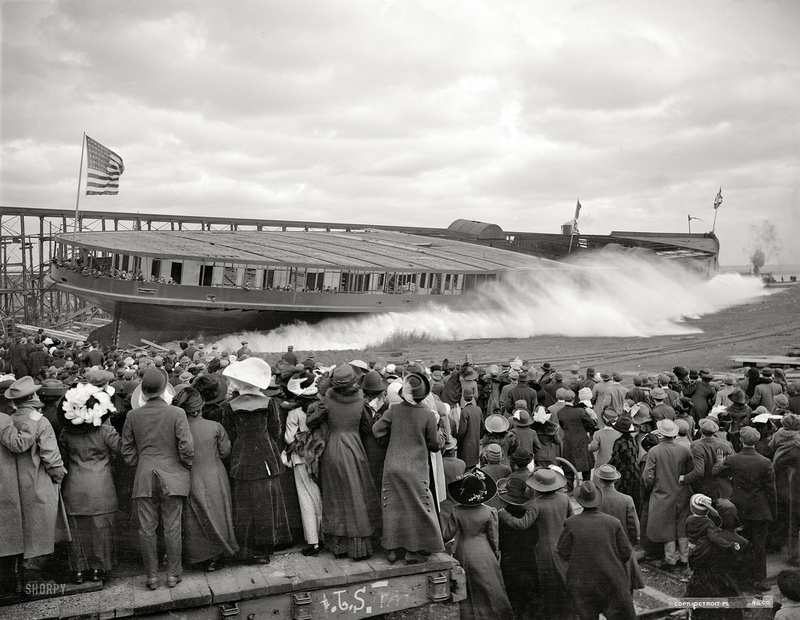 A large crowd gathers as Seeandbee is launched at Wyandotte, Michigan before crews begin work on the superstructure. 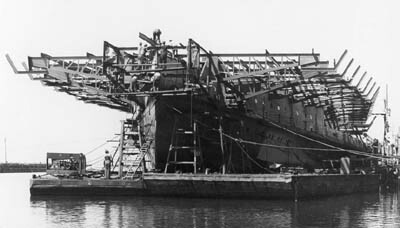 Seeandbee's port side with its four boiler uptake casings towering above and upon which the funnels and intakes will sit. 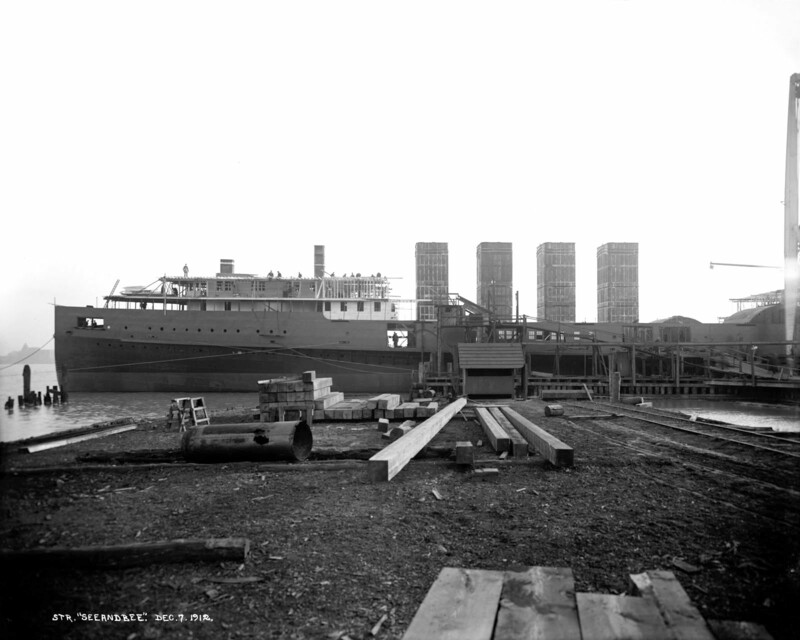 Seeandbee's port side and stern in Detroit Shipbuilding Co.'s, yard. 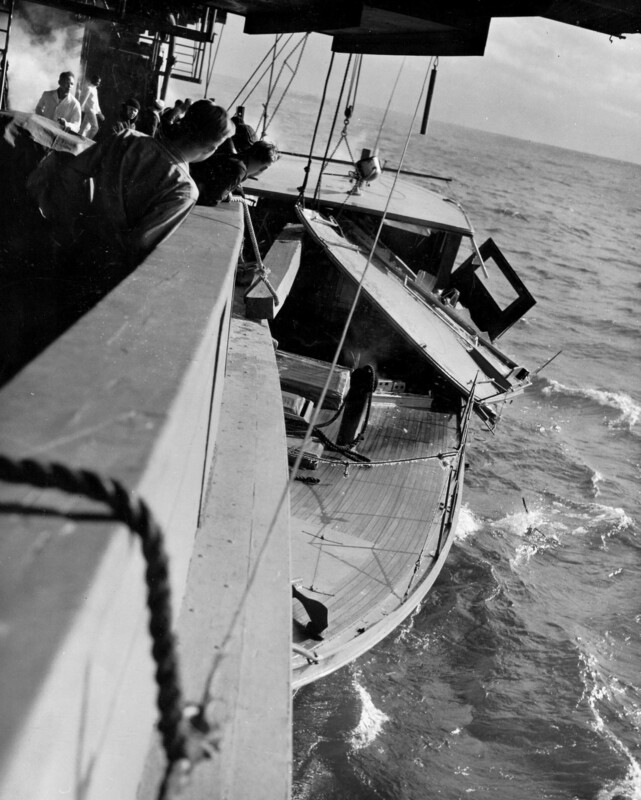 The ship's intakes are sitting toward left. 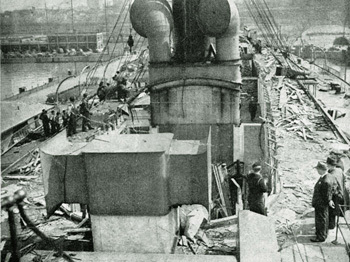 with its four boiler uptake casings towering above and upon which the funnels and intakes will sit. 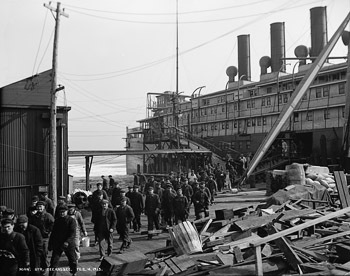 Noon break for crews working on Great Lakes steamer Seeandbee in ship yard of Detroit Shipbuilding Company on Feb 14, 1913. 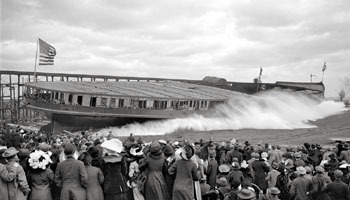 Great Lakes steamer Seeandbee underway shortly after its completion. The steamer Seeandbee with harbor tug on its bow, circa 1920s. A souvenir metal tray from the great ship Seeandbee. Its namesake was for the Cleveland and Buffalo (C&B) Line, which ran between the cities.